On request Epitope Substitution Scans can include selected non-natural amino acids like various D-amino acids or citrulline. Epitope Single Substitution Scans cover the stepwise substitution of all amino acid positions of a given epitope or peptide with all 20 main amino acids and optionally additional non-natural amino acids. Epitope Substitution Scan of a 12 aa starting peptide printed in duplicate. 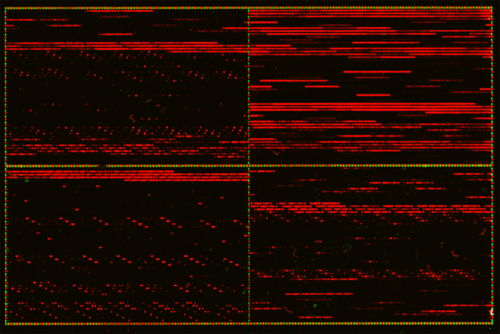 The microarray scan (top left) shows a typical exchange pattern that is translated into a heat map (bottom left). The amino acid plot highlights the change in spot intensities upon amino acid exchange with the wild type epitope at 100%. 7 of 12 amino acids are highly conserved with a limited tolerance for exchange. Stained HA (red) and Flag (green) control peptides frame the single substitution of the starting peptide. In contrast to the stepwise exchanges in the Epitope Single Substitution Scans, Epitope Double Substitution Scans enable the high throughput screening for epitope variants and mimotopes by the exchange of two amino acid positions at once. Epitope Double Substitution Scans are based on PEPperCHIP® Discovery Microarrays. Epitope Double Substitution Scans are hence a unique solution to discover, develop and optimize peptide vaccines, peptide mimotopes or protein target binders in a single assay with tens of thousands of peptide variants. Epitope Double Substitution Scan of a 11 aa starting peptide printed in duplicate. The corresponding PEPperCHIP® Discovery Microarray covered 26,400 different peptides for high throughput identification and optimization of peptide variants in a single assay. Stained HA (red) and Flag (green) control peptides frame and segment the microarray with the peptide double substitution scan . PEPperCHIP®Peptide Microarray analysis for Epitope Substitution Scans is straightforward and can be performed in your own lab or covered by a PEPperMAP® Service. Further information about lab requirements for chip analysis can be found here. Epitope Double Substitution Scans based on PEPperCHIP® Discovery Microarrays are exclusively provided in combination with a comprehensive PEPperMAP® Service.